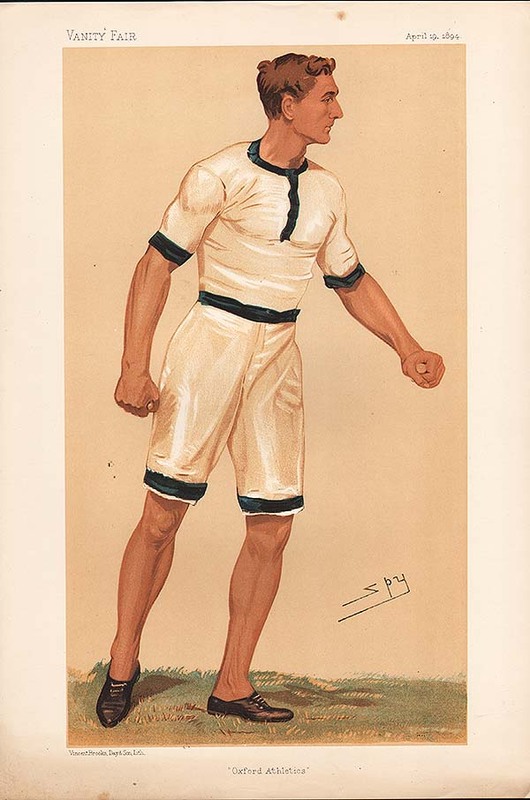 An antique print entitled "Oxford Athletics" produced for the famous Victorian Magazine "Vanity Fair" founded by Thomas Gibson Bowles which commenced publication in 1869. For about forty five years caricatures of famous and infamous personalities were carried in the weekly issues of Vanity Fair. Subjects included Royalty, judges, politicians, musicians, sportsmen, artists, actors and criminals of Victorian and Edwardian Britain. This print by 'Spy' was published April 19th, 1894. The Universities' Athletic Sports, West Brompton : Putting the Weight. An antique woodcut engraving which was published in "The Illustrated London News" in 1875. Later coloured by hand. Highland Games at Aboyne, Aberdeenshire. The Record Long Jump by C. B. Fry, Wadham College, Oxford. 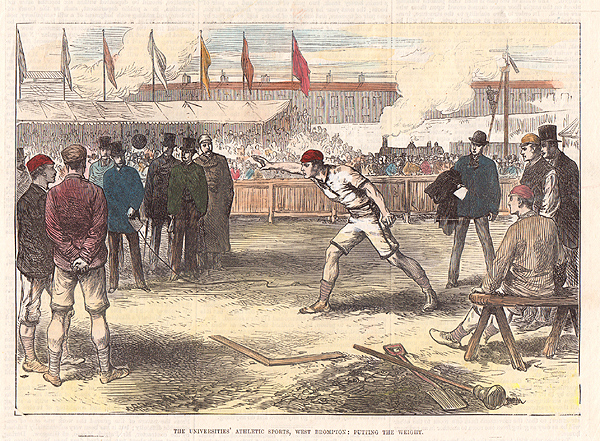 An antique woodcut engraving entitled "Oxford and Cambridge Universities' Athletic Sports : The Record Long Jump by C. B. Fry, Wadham College, Oxford. which was published in "The Illustrated London News." Circa 1893. The colouring is later. The Oxford and Yale Universities' Athletic Sports at The Queens's Club Grounds, West Kensington. A woodcut engraving published in "The Illustrated London News". Circa 1870. The colouring is later. Oxford and Yale Universities' Athletic Sports at The Queens's Club Grounds, West Kensington.